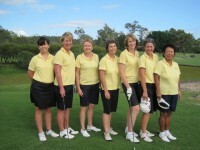 The Business Ladies completed their interclub matchplay at Parkwood over the weekend. Coolangatta Tweed went into the final round trailing by only half a point from Helensvale,and lying equal second with Southport. The ladies played against Beaudesert and with two matches won, and two matches lost, it was up to the final match as a decider.Oculus director, Jenny Dallinger fought valiantly, playing great golf, and took the match to the 18th hole. Unfortunately, she had to give a shot to her opponent on the final hole and was unable to get the win needed to take out the series. Southport came out the winners overall. Congratulations to all the players for a good effort throughout the series. The team (from left) Susan Price, Sue Reguson, Anne Morpeth (C), Rosemary Falk, Jenny Dallinger, Jodie Rockliff, Ada Lincoln.